There are at least two artists called Heinz. 1. 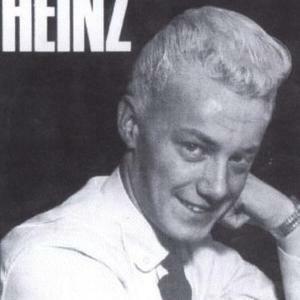 Heinz (full name Heinz Burt) was the bassist for The Tornados before being selected by producer Joe Meek to become a solo act. In 1963 he hit the British Top Five with the Eddie Cochran tribute "Just Like Eddie" before going on to have several other Top 30 hits, including "Country Boy," "You Were There," "Questions I Can't Answer," and "Diggin' My Potatoes." 2. Heinz is a rock band from Austria, also known as Heinz aus Wien. 1. Heinz (full name Heinz Burt) was the bassist for The Tornados before being selected by producer Joe Meek to become a solo act. In 1963 he hit the British Top Five with the Eddie Cochran tribute "Just Like Eddie" before going on to have several other Top 30 hits, including "Country Boy," "You Were There," "Questions I Can't Answer," and "Diggin' My Potatoes." 2. Heinz is a rock band from Austria, also known as Heinz aus Wien.